Atheist individuals are usually not ashamed of letting people know what they believe in. They know the ways of the world and they are aware that they alone determine their identity. Most atheists are confident, bold, and willing to discuss their beliefs at any given point in time. They do not believe in the existence of any deity and are eager to discuss different empirical evidences to prove that god does not exist. However, some people who identify as atheists are scared to bring up the subject because there happens to be a certain stigma associated with it. While believers fear atheism because, let’s face it – nobody likes to be questioned when most of their convictions are based on ludicrous ideas and have little evidence, non-believers fear coming out in the open as atheists because again, nobody likes to be ostracized or judged by society. Today, atheists actually comprise a significant part of society with more men, women, children and elderly joining the movement than ever before. Whether you are an atheist that thinks logically, metaphysically, practically or by any other form of reasoning, you can now flaunt your faith or the lack of it with the help of our innovative accessories. 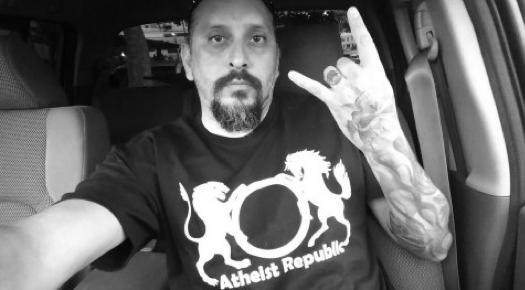 Pick an inspirational necklace from the Atheist Republic gallery to show others that you are a proud atheist and perhaps take some initiative to start a conversation about the subject with those who know little to nothing about atheism. Our necklaces are bold, meaningful and sure to impress even those who do not identify as atheists, urging them to learn more about atheism and getting rid of all inaccurate preconceived notions. So, if you are ready to let the world know that you are firm in your belief and ready to help others draw similar logical conclusions about life, then find the perfect inspirational necklace at Atheist Republic to get started!